Max Elixir was just a great generic Energy accelerator for any deck that could run it. Chances are that somewhere in the top 6 cards of your deck laid an Energy card, just as long as you ran at least 10 basic Energy cards. The great thing about this is that you start out with a great advantage of getting an Energy card even in the early game; with 60 cards in your deck, you draw 7 cards, then set 6 Prize cards away, and so you’ve got 13 cards less in the deck, giving you 47 cards to dig through for an Energy card. The odds are more often than not in your favor with Max Elixir, but sometimes you don’t want to run all the Energy you can just to have it go off. Ironically, the card can get much weaker as time goes by; the more cards you draw, the higher the chance you’ll hit an Energy card with Max Elixir, but the more Energy cards you draw, the less likely you’ll be able to use Max Elixir effectively. The difference between 2 Energy cards in a 12 card stack and 1 Energy card in a 6 card stack is monumental, and that’s assuming you don’t draw through them all first. Certainly keeps you in check with the rest of your deck, prompting you to think of just how many Energy cards you’ve gone through. Definitely a great boon to any deck that’ll run it though! Arora Notealus: I wonder if they’ll bring back stuff like the Ether and Max Elixir cards. They had pretty neat ideas, though I imagine Max Elixir is ultimately better than Ether. Side Reviews: Furfrou – nothing terribly remarkable here, Furfrou’s just an easy draw 5 for one Energy, but the low damage output and the cost of an attack for the turn probably means it’s nothing but binder fodder and collection worthy at best. Pyroar – while the protection against Items and Supporters is nice and all, the requirement for Lysandre Labs to be in play for the extra damage is more of a detriment than a benefit, seeing as the card completely negates Tools, so no other benefits can be added in on top of that. Next Time: You know his name, long after I and just before O! Max Elixir was released on XY BreakPoint and was the 7th best card of the set (https://www.pojo.com/COTD/2016/Feb/11.shtml) and the 3rd best card of the set (https://www.pojo.com/COTD/2016/Dec/28.shtml). This card lets you look at the top six cards of your deck. 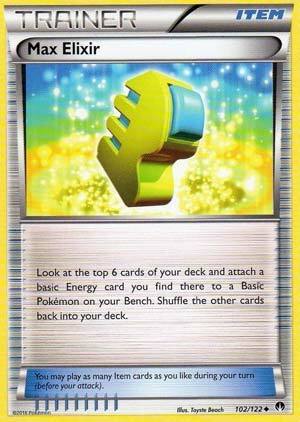 Attach a Basic Energy card to one of your Benched Basic Pokemon. Shuffle the other cards back in your deck. When I looked at this card, I thought it feels like harshly restricted. You can’t look for special energy, you can’t even attach it to your Active Pokemon, and you may fail to find a Energy card from those six cards. Plus, it’s bait for Trashalanche’s damage output. However, that’s too much to wish for, and most cards restrict themselves to keep it from being too good. And I have no problem about that. I haven’t personally used Max Elixir due to not investing enough of certain copies, but I’ve seen it on certain decks that make effective use of it. Decks that doesn’t need Special Energy or being Basic centered will love this card, be it turbo Darkrai, Xerneas BREAK, or Volcanion-EX, even to the point where they might use four of them in one deck to quickly fuel up attacks and overwhelm the opponent. And it can even be made on the second turn of the game when you’re able to attack! With Max Elixir gone, there’s not a card that does a similar thing without doing things differently and being specific. Aqua Patch comes to mind, as it can help Water types fuel up attacks while conserving cards. Darkrai-GX Restoration ability brings itself from the discard into your bench as well as a Basic Dark Energy. But other than that, there’s no turbo deck to consider (if there’s even one). It is a must run in Limited as long as you got a good Benched Pokemon to fuel up attacks. There’s no doubt in my mind that Pokemon got it completely backwards with this card. Max Elixirs should attach only to evolved Pokemon, not Basics. All this card did was give the Big Basic EXs and GXs such an advantage that evolved Pokemon couldn’t hardly keep up. Specifically, Stage 2 Pokemon, as we seem to be able to do alright with some Stage 1 Pokemon, but Stage 2’s are completely uncompetitive at this point. They would be so much more playable, however, if Max Elixirs only attached to them. Stage 2’s would have a tremendous advantage. But that’s not the way things are, and many Big Basic Pokemon have completely abused this card to accelerate their attacks. Lately I’ve had significant success with Max Elixirs and Shaymin SLG and Zygarde FLI 72. There are so many other cards, however, that have used Max Elixirs, and if you’re running Elixirs you should probably run Order Pad and Puzzle of Time as well to maximize the effectiveness of the strategy. Why use Elixir only once? And why wait until later in the game? If you are running Elixirs, however, don’t be surprised if you whiff on them if you run only eleven Basic energy or less. It amazed me that those Yveltal EX decks from a year and a half ago that ran Elixirs would only run nine Basic energy and then wonder why they would miss on their Elixirs. I remember how one youtuber actually declined to play an Elixir early on and instead N’d it back into his deck because he wanted to wait and thin out his deck to ensure the Elixir would hit later. Of course, that logic fails because in addition to playing Items, Supporters, and Pokemon, you’re also playing Basic energy cards, so there’s no guarantee that your ratio of Basic energy cards to total cards in deck will be more favorable later in the game. Plus, what’s the fun in that? You might never get that Elixir back, you might as well play it now. That’s the point of Elixir, to accelerate energy attachment. Hit it early, hit it often and you win. Period. Overall, this is a tremendous card that saw significant use throughout its time in the meta. Most recently, from May 19th through June 23rd, it was the eleventh most played card overall, and it could be found in half of the best performing decks over that time frame. It was the second most common Item card and consisted of almost 14% of all Item cards played. Using Max Elixirs to accelerate your attack was a very common strategy among players, and it is one that I personally will definitely miss. I love this card, I just wish we’d see something like this for Stage 2 Pokemon to help make them more relelvant. We’re getting Masked Royal, but it’s a Supporter so not as good an accelerator as Elixir. Next articleWhich is the best Digital Audio Workstation (DAW)?